SET-listed Solartron Plc (SOLAR) aims to join a bid due to be opened early next year by Tesco Lotus to construct and operate solar rooftop projects for its 32 branches with a combined power-generating capacity of 20 megawatts. Solartron chief executive Patama Wongtoythong said the British hypermarket chain will open bids on the second phase by the first quarter of next year. The company already has 1 million square metres of solar rooftops in Thailand. Solartron last year won the first bid to construct solar rooftops with a total capacity of 10.5MW for 13 branches of Tesco Lotus with an investment budget of 420 million baht. In the first phase, Solartron has already signed engineering, procurement and construction (EPC) contracts and operation contracts for five years with a total area of more than 100,000 sq m.
During the time the business remained in negative territory, Mrs Patama said the company sought to tap into the rising trend of renewable energy by diversifying into solar cell systems and offering EPC services instead of only selling solar panels. She said the company started diversifying into the EPC business and energy service company (Esco) since early this year. 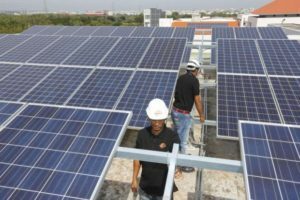 Last year, Solartron also joined a bid to construct and operate Thammasat University’s 20MW solar rooftop project at a cost of 350 million baht. About one-third of the project has already started operation and the rest is expected to be installed by January. She said the Esco business was expected to remain on the rising trend this year, particularly after energy policymakers last week announced the new building energy law, requiring new building owners to install energy-saving systems in their buildings. Several state universities are following Thammasat’s energy-saving initiative, including Chiang Mai University, Naresuan University and Songkhla Nakarin University. Mrs Patama said Esco will be more attractive after energy policymakers plan to allocate a 10-billion-baht budget to promote the Smart Building initiative, which aims to cut energy consumption and boost efficiency. “Almost 90% of our revenue over the past year came from EPC,” she said. The company will make its overseas foray with a plan to bid for a solar power plant in Java, Indonesia with a total capacity of 26MW. SOLAR shares closed Friday on the Stock Exchange of Thailand at 3.50 baht, up four satang, in trade worth 4.4 million baht.